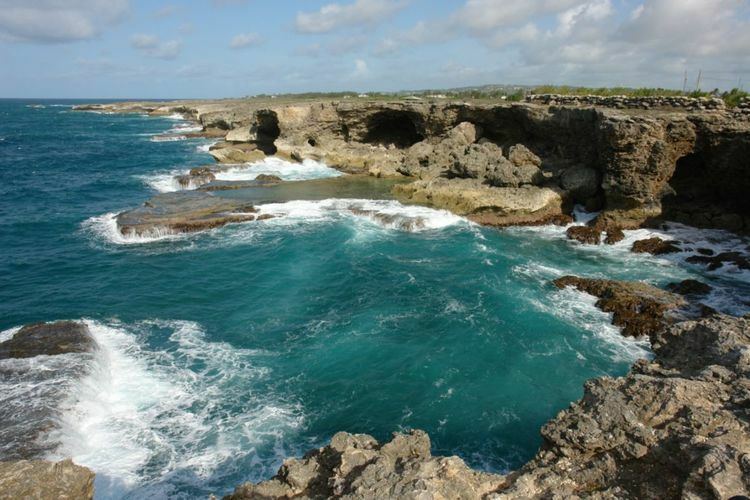 The parish of Saint Lucy ("St. Lucy") is the northern-most area in the country of Barbados. Saint Lucy is known for being the only parish of Barbados out of the eleven to be named after a female patron saint, Saint Lucy of Syracuse. Saint Lucy was the location of a United States Navy base at Harrisons Point. Saint Lucys shape also resembles a peninsula, surrounded on three sides by the Atlantic Ocean to the north, east and west. To the south lies the neighbouring Parish of Saint Peter. As the crow flies, Saint Lucy is the most distant part of Barbados from the capital city Bridgetown, located in the parish of Saint Michael or Grantley Adams International Airport in Christ Church. Saint Lucy remains one of the less populated parts of the island because its remoteness. In a bid to improve the economic fortunes of Saint Lucy, almost every leader of Barbados has grappled with various plans of how to turn around the development status of the Parish. One of the most recent ideas during the 1990s was to capitalise on a venture said to be in the works by Donald Trump in neighbouring Saint Vincent and the Grenadines. It was being proposed that if Donald Trump moved ahead to develop a hotel in those islands, that Barbados could build a second seaport with large ships traveling directly to Saint Vincent and the Grenadines for wealthy land-owners at the Trump development to have easy access to the Grantley Adams airport in Barbados. The closest major town to Saint Lucy in Barbados is Speightstown located in the parish of Saint Peter. Saint Lucy is the birthplace of Barbadoss first Prime Minister, Errol Barrow. It is also the birthplace of two cricketers; Charlie Griffith and Manny Martindale. The historical Parish church for Saint Lucy is located in the Trents/Nessfield area of Saint Lucy. Starting from a point on the seashore directly west of the junction of Highway IC and the public road leading from Shermans to Half Moon Fort, the line travels eastwards to the centre-line of the said road junction; then in a north-easterly direction along Highway 1C to its junction with the private (estate) road leading to Alleynedale Hall; then along this private road and diverting along the northern branch of this road so as to leave the plantation buildings in St. Peter to meet the public road called Highway A leading from Rose Hill to St. Lucy’s Church; then northwards along Highway A to its junction with the public road called Luke Hill; then along this public road in a north-easterly and northerly direction to the junction with the unclassified road leading to Castle Plantation; then along this road in an easterly and south- easterly direction to a point opposite the monument (B.l) placed on the eastern side; then in a north-easterly direction along the line joining this point and another monument (13.2) situate on the western side of an unclassified road at Lamberts and to the centre line of tbe(the) road; then along this road in a north- westerly and north-easterly direction to its junction with the public road leading from Lamberts to Graveyard; then along this public road in an easterly, north- easterly and northerly direction to its junction with the unclassified road leading to Boscobelle; then along this road in a north-easterly, south-easterly and north- easterly direction to the centre of the bridge situate at the point just before the road turns to a south-easterly direction; then in a north-easterly direction (30“ 16) to the sea.